When faced with a pigeon control problem the first response is usually to investigate the pest control marketplace for an appropriate pigeon deterrent device or pigeon exclusion product only to find that there is a huge volume of commercially available pigeon deterrents available and confusion inevitably sets in. With the advent of the Internet and home shopping this plethora of products is available to us all at the click of a button and yet how do we identify the product that will resolve the pigeon control problem that we are experiencing? Is it possible to install a DIY pigeon deterrent system? There appears to be little or no truly independent and impartial advice available and every manufacturer seems to be making conflicting claims about the effectiveness of their particular pigeon control product. Many of the commercially available pigeon deterrents and services appear to be expensive and there are a considerable number of grey areas, certainly where pigeon control services are concerned. So where do you start? Do you just take a chance and order a commercial pigeon deterrent over the Internet without really understanding how or why the product is effective? Do you contact a pest control company and ask for advice or a service? Do you ignore the problem and hope it goes away? So how do you go about understanding which of these pigeon-related problems it is that you are experiencing? Over the period of a few days watch the movements of the pigeons and observe if they are active on the property throughout the day or whether they are only there first thing in the morning and then again an hour or two before dusk. If most of the activity is seen during the daytime, particularly on the upper reaches of the building (i.e. roof areas or top-storey windowsills and guttering), and there is no obvious sign of the birds on the property after dusk or during darkness, then it is likely that you are experiencing a daytime perching problem where the birds are using your property as a vantage point to exploit a food source. If, however, there is increased pigeon activity in the late afternoon or early evening and then again at dawn, with only limited pigeon activity during daylight hours, then it is likely that the birds are roosting overnight and/or possibly breeding on your property. So now you will hopefully have a better idea of why the pigeons are on your property and therefore be in a much better position to choose the correct pigeon deterrent, assuming that it is pigeon deterrents that you need. 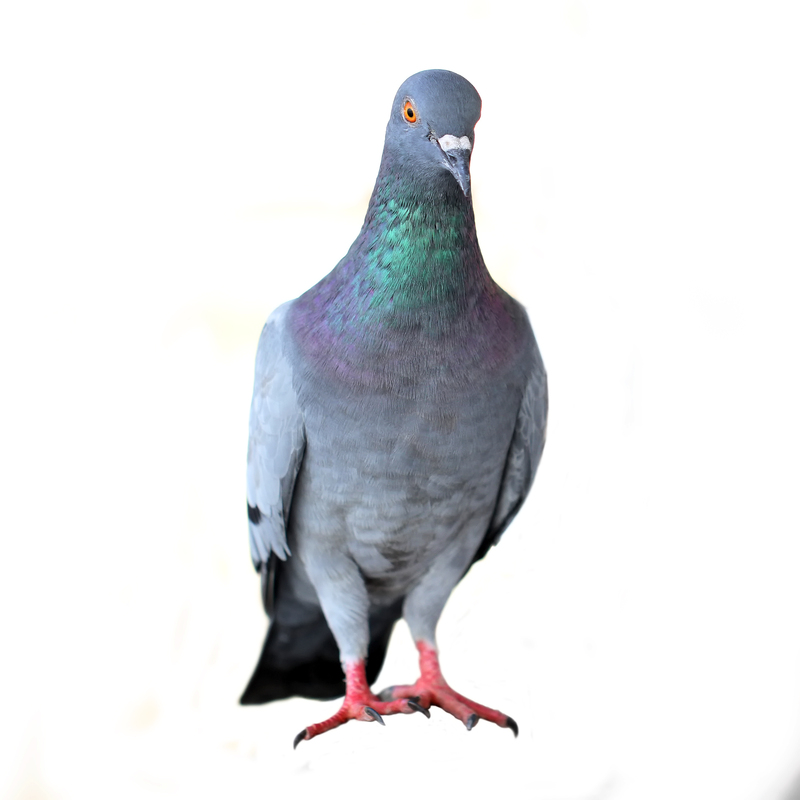 It is not always the case that deterrents alone will resolve a pigeon-related problem, particularly where overnight roosting and breeding-related issues are concerned or where pigeons are being deliberately fed within sight of a building that is experiencing problems. Unsuccessful methods of pigeon control deal mostly with predator fear. Plastic owls are a favorite of the public when, in reality, the fake predator appears as just that—fake. A pigeon will not be any more leery of an unmoving owl than it would an unmoving human. 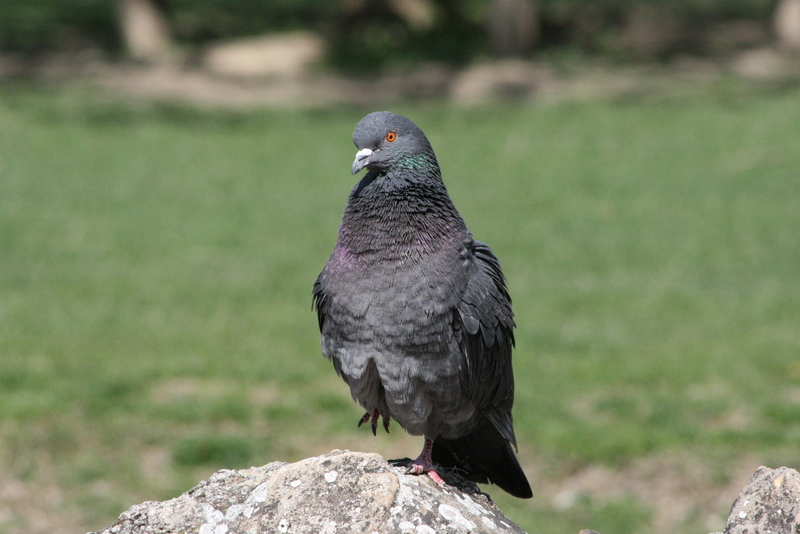 Pigeons are largely unaffected by unpleasant smells, though it has recently been proven that their homing ability is based on scent mapping and not electromagnetic fields. Sounds are another flop when it comes to pigeon control. Ultrasonic sound emitters may very well produce noises humans can’t hear, but rarely are those sounds ‘annoying’ to birds. If a pigeon can put up with all the noise congestion in a busy city, some random sounds from an ultrasonic radio aren’t going to bother it. The most practical ways to get rid of pigeons is to convince them that they do not or cannot stay near your home or business. Any ledge can be a roosting site. By installing pigeon nets, bird spikes or electric shockers, pigeons will be less inclined to settle on those surfaces. Nets and spikes prevent roosting all together. Electric strips may be difficult to install at higher locations, but many brands offer solar power and require little maintenance. Electric strips do require more attention than netting and are often more expensive. If your building has smaller sections of roof, bird “spiders” are useful instruments. The wire device resembles a sprinkler in design with thin lines of arced metal extending outward from a central location. These wires are loose and are not strong enough to support the weight of a bird. 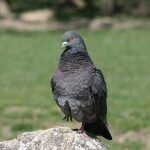 Information about how to keep pigeons away – prevention techniques. There is something to be said for determination, too. 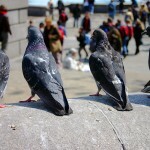 Even though most scare tactics do not work on pigeons, harassment techniques can prove beneficial if done frequently and without fail. If pigeons have taken over your yard, letting your dog out will chase them away. Yes, they will come back when the dog is gone, but if this scenario is repeated often enough the pigeons will learn that your yard is not the easiest place to visit. When it comes to opportunistic birds, life is all about easy. Some towns and cities have experimented with employing the use of falcons to control pigeon populations. The benefit to using birds of prey is that they often keep the pigeons moving, preventing any one roosting area to become long-term. Unfortunately, falcons cannot eliminate a large enough number of the nuisance birds to make a noticeable difference without becoming a nuisance bird themselves. Pigeon Appearance: Pigeons are robust birds with short necks, usually gray in color with a faint iridescence to their feathers. They have a characteristic back and forth rhythm to their head. This bobbing is a mechanism that allows the birds to focus their vision and perceive depth. Pigeons have duplicate black bands on each wing, but the coloration on the main part of the body can vary. Their feet are suited for perching on ledges and high peaks. The beak of the pigeon is medium in both length and width, ideal for pulling apart bread, picking up small food pieces, or fishing spiders out of cracks. 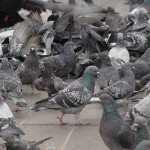 Pigeon Habitat and Behavior: Pigeons are most often seen in cities. This habitat preference is largely due to the surplus of food available and the high roosting opportunities. Pigeons are fond of the water towers on tall buildings, often building messy nests on the rim. For this reason, most cities require water towers be completely sealed to prevent the birds or their waste from contaminating the water supply. A pigeon will nest almost anywhere and will often do so with many others of its kind. A roost can be made atop any vertical surface. Pigeons are known in invade gutters, ducts, air conditioners, attics, warehouses, and drains. They are not overly concerned with sanitary conditions and will utilize any vertical object in any location for their purposes. Pigeons are also very food-driven. This problem has been made serious by the continued, deliberate feeding of the birds in urban areas. The birds have little fear of humans and will often converge around people in parks and near restaurants. 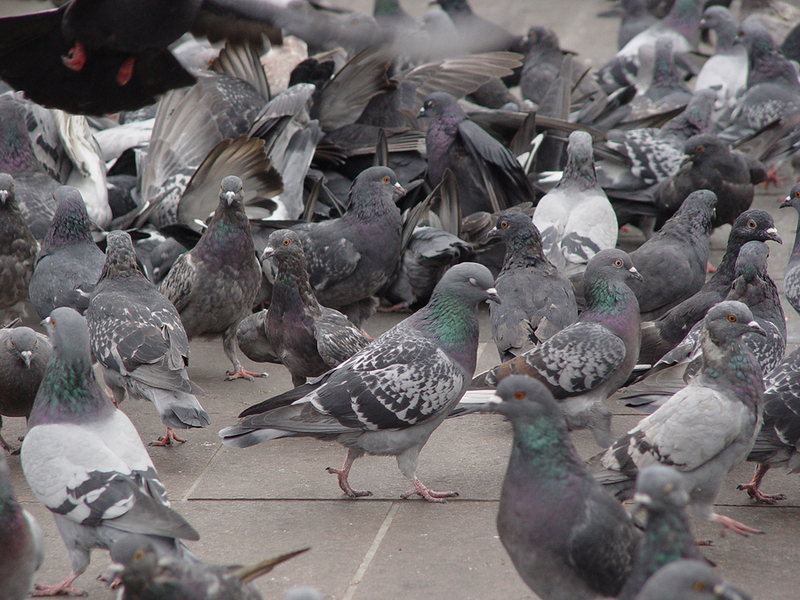 Pigeon feeding is a common hobby of many city-goers, yet another reason for the lack of caution around humans. Egg laying can take place as often as every other month. Courtship between the male and the female is brief, and the resulting egg clutch usually only contains two eggs. An abundance of pigeons will result in quick overpopulation, regardless of how many eggs are laid per pair. Some cites have sought population control by replacing viable eggs with fake or unfertilized eggs. This tactic may be effective short-term, but pigeons will lay another clutch once the original appears unproductive. Pigeon Diet: Pigeons will scavenge for almost any type of grain-based food source. The habit of city restaurants discarding stale bread into parks increases the role this type of food plays in the pigeon diet. In nature, the birds eat insects, berries, seeds, grains, and spiders. Pigeon Nuisance Concerns: Pigeons are not as bold as some species of birds adapted to living off human leftovers. 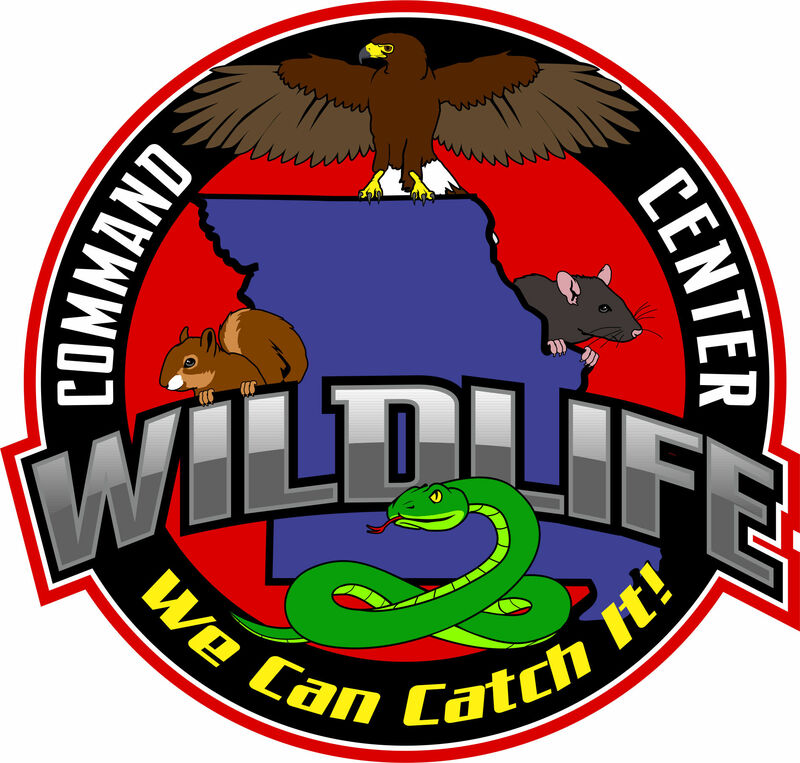 The major concern when it comes to this species centers on its roosting habits. Pigeons most often roost in number. They are not a sanitary bird, often eliminating waste in their own nests, and living on top of the bodies of their own kind. 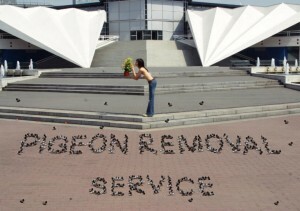 Pigeon waste is caustic and will do permanent damage to stone and concrete. 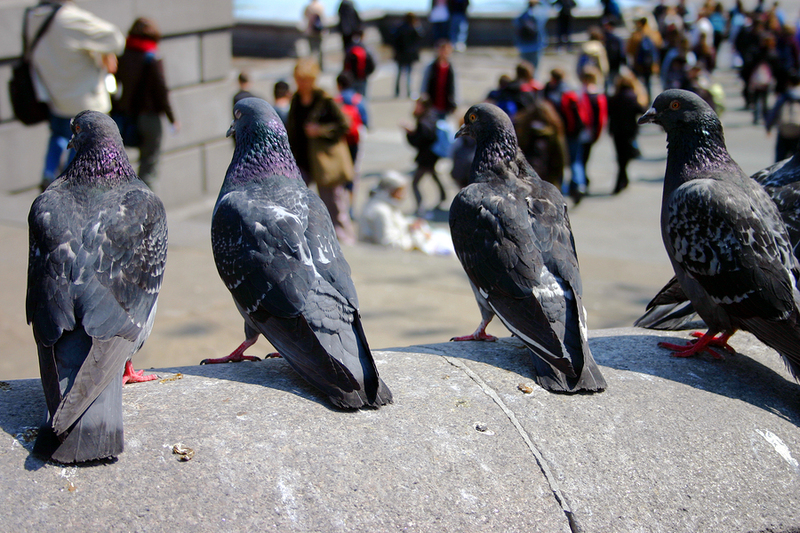 In many cities, water contamination due to pigeons and their droppings has been a major concern. Because these birds pool around areas with a high opportunity for food (such as restaurants), there is a logical concern for public health. Pigeon Diseases: The most common zoonotic disease associated with pigeons is called histoplasmosis. This disease is caused by a fungal infection facilitated by the dried powder of pigeon feces. People with compromised immune systems should also be wary of cryptococcosis, another fungal infection affecting only those without healthy defenses. Psittacosis, more commonly transmitted by exotic birds, has been reported in larger cities. These illnesses present with flu-like symptoms, making diagnosis and treatment difficult unless the disease is well underway. This site is intended to provide pigeon education and information, so that you can make an informed decision if you need to deal with a pigeon problem. 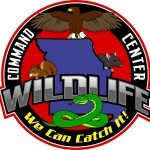 This site provides many pigeon control articles and strategies, if you wish to attempt to solve the problem yourself. If you are unable to do so, which is likely with many cases of pigeon removal, please go to the home page and click contact, where I have wildlife removal experts, who can properly help you with your nuisance pigeon.